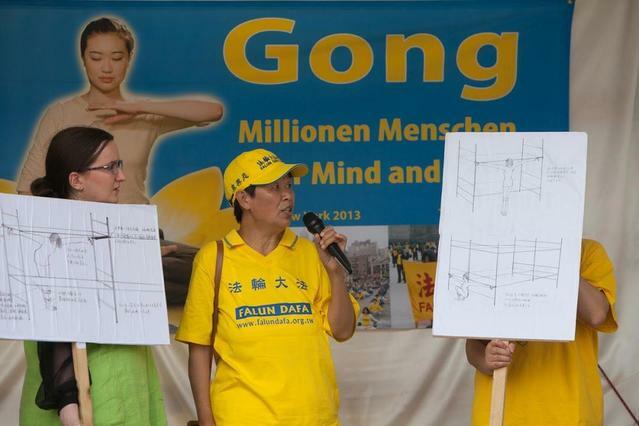 German Falun Gong practitioners held a rally at Potsdamer Platz in central Berlin on July 13 to raise awareness of the ongoing persecution in China. Three practitioners talked of their experience of being detained and tortured in Chinese labour camps for refusing to renounce Falun Gong, a peaceful cultivation practice based on the principles of Truthfulness-Compassion-Forbearance. Ms. Xu Hui, a practitioners from Liaoning Province, was arrested three times for practising Falun Gong, followed by detention in over 10 locations including the notorious Masanjia Labour Camp. Many Falun Gong practitioners have been severely tortured at Masanjia. “I was slapped in the face, shocked with electric batons, force-fed, forced to ingest drugs, handcuffed or hung up for long periods of time. And sleep deprivation was another routine,” she recalled. After being handcuffed tightly to a heating pipe for three consecutive days, her hands were disabled. Because of muscular atrophy and loss of sensation in her hands, she was unable to make a fist with her right hand. The brutal forced-feeding also led to the loss of three teeth. Ms. Xu Hui, nearly 60, became emaciated from torture and poor living and work conditions. Her weight dropped to 40 kilograms (88 pounds). Ms. Li Jun, also from Liaoning Province, has been arrested four time since the suppression began in 1999. She was also detained twice at Masanjia Labour Camp. “I was sent to the Dalian Labour Camp in August 2003 for a term of two years,” she said. She was forced to stand for long periods of time, once for 15 days straight in solitary confinement. “I had to stand in a metal cage 24 hours a day,” recalled Ms. Li. In addition, the guards restricted her access to the toilet. They also ordered inmates to watch her all the time and beat her brutally whenever she closed her eyes. As a result, her legs were severely swollen, her face was badly bruised, and she almost lost consciousness. Ms. Li was often hung by her handcuffed arms from a heating pipe, with her feet off the floor. The handcuffs cut into the flesh of her wrists, causing excruciating pain. Mr. Guo Jufeng, a resident of Shuangyashan City, Heilongjiang Province, was arrested four times in China for practising Falun Gong. “After the last arrest, I was detained in three labour camps one after another, where I suffered more than 30 types of physical and mental torture.” Once, he was shocked with electric batons for five hours, to the extent that he could smell his flesh burning. In addition, Mr. Guo was detained in solitary confinement twice, for over 40 days in total. The cell was very small. Just two meals were provided every day, each with one piece corn bread. Because the corn bread was cold and dry, it was hard to swallow. However, no water was given. He had to drink water from the toilet when he was thirsty. “Through the years, more than 20 Falun Gong practitioners I knew have lost their lives because of torture during detention,” said Mr. Guo. When Mr. Guo came to Germany on a business trip in January 2008, another wave of suppression in China started prior to the Beijing Olympics. So he stayed in Germany since that time. Klaus Linke and Elke Heitz, who lived in West Berlin during the Cold War, said that they were familiar with the terror brought about by communism. Upon hearing about forced organ harvesting from living Falun Gong practitioners in China, Mr. Linke said he had read about this previously, but the real situation was much worse than he had thought. A family of four, the Heins discussed the persecution for a long time after they spoke with a practitioner. “I really like the meditation, it is so beautiful and peaceful,” said Annett Hein. Alexandra Sekolska and Wogtek Diotrowicz were visiting from Poland. They had read about the persecution in newspapers several years ago. “China is a beautiful country, but the people there have no freedom,” remarked Mr. Diotrowicz. “We Polish have abandoned communism and it is sad to see Chinese people still suffering from it,” said Ms. Sekolska. She hopes the situation will change soon.